HealthManagement's Imaging Editor-in-Chief, Prof. Lluis Donoso Bach, was today awarded honorary membership of the Radiological Society of North America (RSNA). Prof. Donoso Bach is past president of the European Society of Radiology and Head of Diagnostic Imaging at Hospital Clinic Barcelona. Donoso Bach said he was honoured to receive this award from the RSNA, an organisation for which he has the utmost respect. 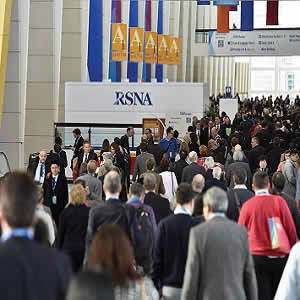 "Probably no other organisation in the world does as good a job of promoting its profession as the RSNA does for radiology. Both individual radiologists and organisations in other countries look at you when it comes to leadership", he said. He noted that the European Society of Radiology greatly appreciates the bonds built through the collaboration with RSNA over the years, adding: "I look forward to working together to strengthen our profession in this global scenario." RSNA president, Richard L. Baron paid tribute to Prof. Donoso as a leader in building relationships with radiologic societies across the globe and as a pioneer in creating the virtual radiology conference. Also awarded Honorary Membership today were Dr. Carlos Bartolozzi, Italy and Dr. Osamu Matsui, Japan (pictured with Prof. Donoso Bach, below). Dr. Bartolozzi is a preeminent researcher, educator and innovator, who retired as radiology professor and chair of the Department of Radiology at the University Hospital of Pisa in 2014. He is widely recognised for his devotion to educating and mentoring the next generation of radiologists in Italy and beyond. Dr. Matsui is a world-renowned researcher, educator and innovator who has significantly advanced the detection and treatment of liver cancer. He retired from Kanazawa University in 2013, and remains on staff as professor emeritus and a research professor in the Department of Advanced Medical Imaging. Dr. Matsui dedicated his award to his parents, who provided primary care in a very rural part of Japan. 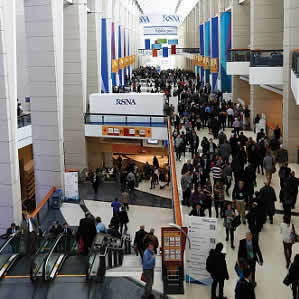 RSNA16: Can Inappropriate Imaging for Low Back Pain Be Reduced?